The festivals of Rome are innumerable; but five of the most important may be singled out for elucidation—viz., Christmas-day, Lady-day, Easter, the Nativity of St. John, and the Feast of the Assumption. Each and all of these can be proved to be BabyIonian. And first, as to the festival in honour of the birth of Christ, or Christmas. How comes it that that festival was connected with the 25th of December? There is not a word in the Scriptures about the precise day of His birth, or the time of the year when He was born. What is recorded there, implies that at what time soever His birth took place, it could not have been on the 25th of December. At the time that the angel announced His birth to the shepherds of Bethlehem, they were feeding their flocks by night in the open fields. Now, no doubt, the climate of Palestine is not so severe as the climate of this country; but even there, though the heat of the day be considerable, the cold of the night, from December to February, is very piercing, and it was not the custom for the shepherds of Judea to watch their flocks in the open fields later than about the end of October. It is in the last degree incredible, then, that the birth of Christ could have taken place at the end of December. There is great unanimity among commentators on this point. Besides Barnes, Doddridge, Lightfoot, Joseph Scaliger, and Jennings, in his “Jewish Antiquities,” who are all of opinion that December 25th could not be the right time of our Lord’s nativity, the celebrated Joseph Mede pronounces a very decisive opinion to the same effect. After a long and careful disquisition on the subject, among other arguments he adduces the following:—“At the birth of Christ every woman and child was to go to be taxed at the city whereto they belonged, whither some had long journeys; but the middle of winter was not fitting for such a business, especially for women with child, and children to travel in. Therefore, Christ could not be born in the depth of winter. Again, at the time of Christ’s birth, the shepherds lay abroad watching with their flocks in the night time; but this was not likely to be in the middle of winter. And if any shall think the winter wind was not so extreme in these parts, let him remember the words of Christ in the gospel, ‘Pray that your flight be not in the winter.’ If the winter was so bad a time to flee in, it seems no fit time for shepherds to lie in the fields in, and women and children to travel in.” Indeed, it is admitted by the most learned and candid writers of all parties that the day of our Lord’s birth cannot be determined, and that within the Christian Church no such festival as Christmas was ever heard of till the third century, and that not till the fourth century was far advanced did it gain much observance. How, then, did the Romish Church fix on December the 25th as Christmas-day? Why, thus: Long before the fourth century, and long before the Christian era itself, a festival was celebrated among the heathen, at that precise time of the year, in honour of the birth of the son of the Babylonian queen of heaven; and it may fairly be presumed that, in order to conciliate the heathen, and to swell the number of the nominal adherents of Christianity, the same festival was adopted by the Roman Church, giving it only the name of Christ. This tendency on the part of Christians to meet Paganism half-way was very early developed; and we find Tertullian, even in his day, about the year 230, bitterly lamenting the inconsistency of the disciples of Christ in this respect, and contrasting it with the strict fidelity of the Pagans to their own superstition. “By us,” says he, “who are strangers to Sabbaths, and new moons, and festivals, once acceptable to God, the Saturnalia, the feasts of January, the Brumalia, and Matronalia, are now frequented; gifts are carried to and fro, new year’s day presents are made with din, and sports and banquets are celebrated with uproar; oh, how much more faithful are the heathen to their religion, who take special care to adopt no solemnity from the Christians.” Upright men strove to stem the tide, but in spite of all their efforts, the apostasy went on, till the Church, with the exception of a small remnant, was submerged under Pagan superstition. That Christmas was originally a Pagan festival, is beyond all doubt. The time of the year, and the ceremonies with which it is still celebrated, prove its origin. In Egypt, the son of Isis, the Egyptian title for the queen of heaven, was born at this very time, “about the time of the winter solstice.” The very name by which Christmas is popularly known among ourselves—Yule-day—proves at once its Pagan and Babylonian origin. “Yule” is the Chaldee name for an “infant” or “little child;” and as the 25th of December was called by our Pagan Anglo-Saxon ancestors, “Yule-day,” or the “Child’s day,” and the night that preceded it, “Mother-night,” long before they came in contact with Christianity, that sufficiently proves its real character. Far and wide, in the realms of Paganism, was this birth-day observed. This festival has been commonly believed to have had only an astronomical character, referring simply to the completion of the sun’s yearly course, and the commencement of a new cycle. But there is indubitable evidence that the festival in question had a much higher reference than this—that it commemorated not merely the figurative birth-day of the sun in the renewal of its course, but the birth-day of the grand Deliverer. Among the Sabeans of Arabia, who regarded the moon, and not the sun, as the visible symbol of the favourite object of their idolatry, the same period was observed as the birth festival. Thus we read in Stanley’s Sabean Philosophy: “On the 24th of the tenth month,” that is December, according to our reckoning, “the Arabians celebrated the BIRTHDAY OF THE LORD—that is the Moon.” The Lord Moon was the great object of Arabian worship, and that Lord Moon, according to them, was born on the 24th of December, which clearly shows that the birth which they celebrated had no necessary connection with the course of the sun. It is worthy of special note, too, that if Christmas-day among the ancient Saxons of this island, was observed to celebrate the birth of any Lord of the host of heaven, the case must have been precisely the same here as it was in Arabia. The Saxons, as is well known, regarded the Sun as a female divinity, and the Moon as a male. It must have been the birth-day of the Lord Moon, therefore, and not of the Sun, that was celebrated by them on the 25th of December, even as the birth-day of the same Lord Moon was observed by the Arabians on the 24th of December. The name of the Lord Moon in the East seems to have been Meni, for this appears the most natural interpretation of the Divine statement in Isaiah 65:11, “But ye are they that forsake my holy mountain, that prepare a temple for Gad, and that furnish the drink-offering unto Meni.” There is reason to believe that Gad refers to the sun-god, and that Meni in like manner designates the moon-divinity. Meni, or Manai, signifies “The Numberer,” and it is by the changes of the moon that the months are numbered: Psalm 104:19, “He appointed the moon for seasons: the sun knoweth the time of its going down.” The name of the “Man of the Moon,” or the god who presided over that luminary among the Saxons, was Mane, as given in the “Edda,” and Mani, in the “Voluspa.” That it was the birth of the “Lord Moon” that was celebrated among our ancestors at Christmas, we have remarkable evidence in the name that is still given in the lowlands of Scotland to the feast on the last day of the year, which seems to be a remnant of the old birth festival for the cakes then made are called Nur-Cakes, or Birth-cakes. That name is Hogmanay. Now, “Hog-Manai” in Chaldee signifies “The feast of the Numberer;” in other words, The festival of Deus Lunus, or of the Man of the Moon. To show the connection between country and country, and the inveterate endurance of old customs, it is worthy of remark, that Jerome, commenting on the very words of Isaiah already quoted, about spreading “a table for Gad,” and “pouring out a drink-offering to Meni,” observes that it “was the custom so late as his time [in the fourth century], in all cities especially in Egypt and at Alexandria, to set tables, and furnish them with various luxurious articles of food, and with goblets containing a mixture of new wine, on the last day of the month and the year, and that the people drew omens from them in respect of the fruitfulness of the year.” The Egyptian year began at a different time from ours; but this is as near as possible (only substituting whisky for wine), the way in which Hogmanay is still observed on the last day of the last month of our year in Scotland. I do not know that any omens are drawn from anything that takes place at that time, but everybody in the south of Scotland is personally cognisant of the fact, that, on Hogmanay, or the evening before New Year’s day, among those who observe old customs, a table is spread, and that while buns and other dainties are provided by those who can afford them, oat cakes and cheese are brought forth among those who never see oat cakes but on this occasion, and that strong drink forms an essential article of the provision. Even where the sun was the favourite object of worship, as in Babylon itself and elsewhere, at this festival he was worshipped not merely as the orb of day, but as God incarnate. It was an essential principle of the Babylonian system, that the Sun or Baal was the one only God. When, therefore, Tammuz was worshipped as God incarnate, that implied also that he was an incarnation of the Sun. In the Hindoo mythology, which is admitted to be essentially Babylonian, this comes out very distinctly. There, Surya, or the Sun, is represented as being incarnate, and born for the purpose of subduing the enemies of the gods, who, without such a birth, could not have been subdued. It was no mere astronomic festival, then, that the Pagans celebrated at the winter solstice. That festival at Rome was called the feast of Saturn, and the mode in which it was celebrated there, showed whence it had been derived. The feast, as regulated by Caligula, lasted five days; loose reins were given to drunkenness and revelry, slaves had a temporary emancipation, and used all manner of freedoms with their masters. This was precisely the way in which, according to Berosus, the drunken festival of the month Thebeth, answering to our December, in other words, the festival of Bacchus, was celebrated in Babylon. “It was the custom,” says he, “during the five days it lasted, for masters to be in subjection to their servants, and one of them ruled the house, clothed in a purple garment like a king.” This “purple-robed” servant was called “Zoganes,” the “Man of sport and wantonness,” and answered exactly to the “Lord of Misrule,” that in the dark ages, was chosen in all Popish countries to head the revels of Christmas. The wassailling bowl of Christmas had its precise counterpart in the “Drunken festival” of Babylon; and many of the other observances still kept up among ourselves at Christmas came from the very same quarter. The candles, in some parts of England, lighted on Christmas-eve, and used so long as the festive season lasts, were equally lighted by the Pagans on the eve of the festival of the Babylonian god, to do honour to him: for it was one of the distinguishing peculiarities of his worship to have lighted wax-candles on his altars. The Christmas tree, now so common among us, was equally common in Pagan Rome and Pagan Egypt. 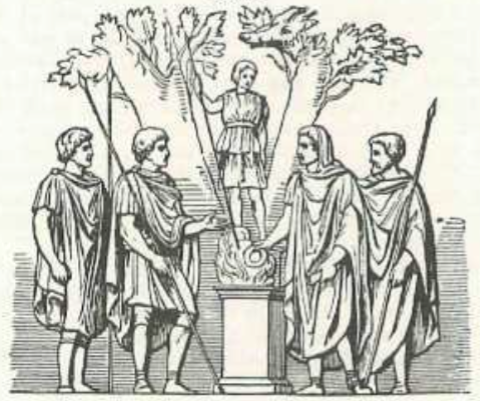 In Egypt that tree was the palm-tree; in Rome it was the fir; the palm-tree denoting the Pagan Messiah, as Baal-Tamar, the fir referring to him as Baal-Berith. The mother of Adonis, the Sun-God and great mediatorial divinity, was mystically said to have been changed into a tree, and when in that state to have brought forth her divine son. If the mother was a tree, the son must have been recognised as the “Man the branch.” And this entirely accounts for the putting of the Yule Log into the fire on Christmas-eve, and the appearance of the Christmas-tree the next morning. As Zero-Asbta, “The seed of the woman,” which name also signified Ignigena, or “born of the fire,” he has to enter the fire on “Mother-night,” that he may be born the next day out of it, as the “Branch of God,” or the Tree that brings all divine gifts to men. But why, it may be asked, does he enter the fire under the symbol of a Log? To understand this, it must be remembered that the divine child born at the winter solstice was born as a new incarnation of the great god (after that god had been cut in pieces), on purpose to revenge his death upon his murderers. Now the great god, cut off in the midst of his power and glory, was symbolised as a huge tree, stripped of all its branches, and cut down almost to the ground. 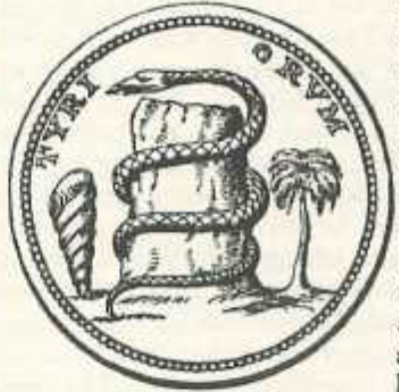 But the great serpent, the symbol of the life restoring AEsculapius, twists itself around the dead stock, and lo, at its side up sprouts a young tree—a tree of an entirely different kind, that is destined never to be cut down by hostile power—even the palm-tree, the well-known symbol of victory. Now the Yule Log is the dead stock of Nimrod, deified as the sun-god, but cut down by his enemies; the Christmas-tree is Nimrod redivivus—the slain god come to life again. In the light reflected by the above statement on customs that still linger among us, the origin of which has been lost in the midst of hoar antiquity, let the reader look at the singular practice still kept up in the South on Christmas-eve, of kissing under the misletoe bough. That misletoe bough in the Druidic superstition, which, as we have seen, was derived from Babylon, was a representation of the Messiah, “The man the branch.” The misletoe was regarded as a divine branch—a branch that came from heaven, and grew upon a tree that sprung out of the earth. Thus by the engrafting of the celestial branch into the earthly tree, heaven and earth, that sin had severed, were joined together, and thus the misletoe bough became the token of Divine reconciliation to man, the kiss being the well-known token of pardon and reconciliation. Whence could such an idea have come? May it not have come from the eighty-fifth Psalm, ver. 10,11, “Mercy and truth are met together; righteousness and peace have KISSED each other. Truth shall spring out of the earth [in consequence of the coming of the promised Saviour], and righteousness shall look down from heaven”? Certain it is that that Psalm was written soon after the Babylonish captivity; and as multitudes of the Jews, after that event, still remained in Babylon under the guidance of inspired men, such as Daniel, as a part of the Divine word it must have been communicated to them, as well as to their kinsmen in Palestine. Babylon was, at that time, the centre of the civilised world; and thus Paganism, corrupting the Divine symbol as it ever has done, had opportunities of sending forth its debased counterfeit of the truth to all the ends of the earth, through the Mysteries that were affiliated with the great central system in Babylon. Thus the very customs of Christmas still existent cast surprising light at once on the revelations of grace made to all the earth, and the efforts made by Satan and his emissaries to materialise, carnalise, and degrade them. In many countries the boar was sacrificed to the god, for the injury a boar was fabled to have done him. According to one version of the story of the death of Adonis, or Tammuz, it was, as we have seen, in consequence of a wound from the tusk of a boar that he died. The Phrygian Attes, the beloved of Cybele, whose story was identified with that of Adonis, was fabled to have perished in like manner, by the tusk of a boar. Therefore, Diana, who though commonly represented in popular myths only as the huntress Diana, was in reality the great mother of the gods, has frequently the boar’s head as her accompaniment, in token not of any mere success in the chase, but of her triumph over the grand enemy of the idolatrous system, in which she occupied so conspicuous a place. According to Theocritus, Venus was reconciled to the boar that killed Adonis, because when brought in chains before her, it pleaded so pathetically that it had not killed her husband of malice prepense, but only through accident. But yet, in memory of the deed that the mystic boar had done, many a boar lost its head or was offered in sacrifice to the offended goddess. In Smith, Diana is represented with a boar’s head lying beside her, on the top of a heap of stones, and in the accompanying woodcut, in which the Roman Emperor Trajan is represented burning incense to the same goddess, the boar’s head forms a very prominent figure. Hence the boar’s head is still a standing dish in England at the Christmas dinner, when the reason of it is long since forgotten. Yea, the “Christmas goose” and “Yule cakes” were essential articles in the worship of the Babylonian Messiah, as that worship was practised both in Egypt and at Rome. 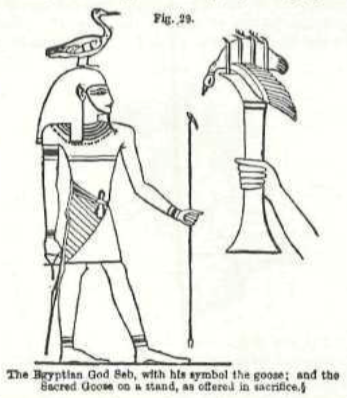 Wilkinson, in reference to Egypt, shows that “the favourite offering” of Osiris was “a goose,” and moreover, that the “goose could not be eaten except in the depth of winter.” As to Rome, Juvenal says, “that Osiris, if offended, could be pacified only by a large goose and a thin cake.” In many countries we have evidence of a sacred character attached to the goose. It is well known that the capitol of Rome was on one occasion saved when on the point of being surprised by the Gauls in the dead of night, by the cackling of the geese sacred to Juno, kept in the temple of Jupiter. 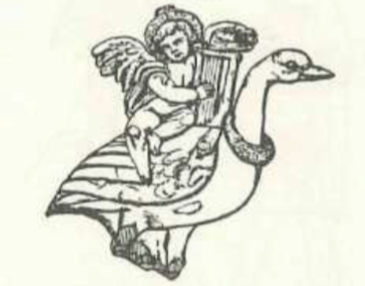 The accompanying wood-cut proves that the goose in Asia Minor was the symbol of Cupid, just as it was the symbol of Seb in Egypt. In India, the goose occupied a similar position; for in that land we read of the sacred “Brahmany goose,” or goose sacred to Brahma. Finally, the monuments of Babylon show that the goose possessed a like mystic character in Chaldea, and that it was offered in sacrifice there, as well as in Rome or Egypt, for there the priest is seen with the goose in the one hand, and his sacrificing knife in the other. There can be no doubt, then, that the Pagan festival at the winter solstice—in other words, Christmas—was held in honour of the birth of the Babylonian Messiah. The consideration of the next great festival in the Popish calendar gives the very strongest confirmation to what has now been said. That festival, called Lady-day, is celebrated at Rome on the 25th of March, in alleged commemoration of the miraculous conception of our Lord in the womb of the Virgin, on the day when the angel was sent to announce to her the distinguished honour that was to be bestowed upon her as the mother of the Messiah. But who could tell when this annunciation was made? The Scripture gives no clue at all in regard to the time. But it mattered not. Before our Lord was either conceived or born, that very day now set down in the Popish calendar for the “Annunciation of the Virgin” was observed in Pagan Rome in honour of Cybele, the Mother of the Babylonian Messiah. Now, it is manifest that Lady-day and Christmas-day stand in intimate relation to one another. Between the 25th of March and the 25th of December there are exactly nine months. If, then, the false Messiah was conceived in March and born in December, can any one for a moment believe that the conception and birth of the true Messiah can have so exactly synchronised, not only to the month, but to the day? The thing is incredible. Lady-day and Christmas-day, then, are purely Babylonian. » Next: "The Strict Baptist Movement"
« Prev: "An Example Of A Mother Explaining The Gospel To Her Child"